The tower contains a ring of six bells, cast in 1845 by C & G Mears of London and installed by Patrick Brontë with money raised by public subscription. The tenor bell which weighs nearly 11 cwt. (553 kg), bears an inscription to this effect. The tower obviously had an active and accomplished band of ringers and the bells may well have rung for Charlotte Brontë’s wedding. Ringing continued until well after the Second World War but then gradually declined until the bells became unringable in the 1970’s. 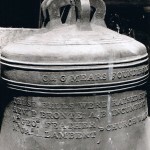 The bells were restored in May 1988 with gifts from the Church and Brontë Society, friends and local businesses. The initial donation was given in memory of Charles Gordon Vestey. 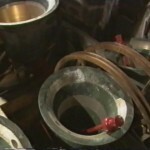 The restoration was carried out by John Taylor’s of Loughborough and the bells have been in regular use ever since. MR. GEOE. Feather – Church Warden. MR. JAS. Lambert – Church Warden. The bells are hung for change ringing so that each bell turns through a full circle when rung. This gives very precise control and the distinctive ‘swirling sound’ so characteristic of church bells in this country. 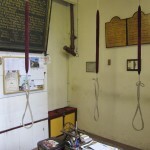 This way of ringing is peculiarly English; there are not that many churches in Wales, Scotland and Ireland where bells are rung in this way and very few outside the British Isles. The aim is not to ring tunes but instead a series of sequences called changes. The changes are produced by ringing the bells in a different order each time the rope is pulled and are governed by a set pattern. These patterns are called methods and each method is named. This style of ringing dates from the beginning of the 17th century and the object is to ring as many different changes before any sequence is repeated. One particular feat is to ring in excess of 5000 changes without stopping and this is called a peal. This takes about three hours and there have been 19 peals at Haworth. The most recent of these was rung by members of the local band to celebrate the wedding of Prince William and Catherine Middleton. 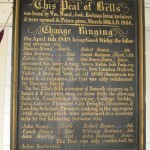 Some of these performances are recorded on boards in the ringing chamber. We have an active and thriving band who ring regularly for Sunday Service at 10.00 am and practice on Monday evenings from 7.30 pm. We ring for weddings and other special occasions as required. There is a thriving social life. The practice is usually followed by a visit to a local hostelry and there are regular social gatherings including the annual Guild Meal. We also arrange one or two outings per year where other churches are visited to try their bells. 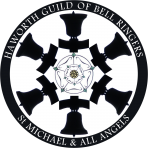 There is a local and national network of ringing societies (we are part of the Yorkshire Association of Change Ringers) as well as an informal, national fellowship of ringers which ensures that members are welcome in any other ringing tower in the country. We are always looking for recruits and if you would like to join us and keep the Brontë Bells ringing you would find it a fascinating and traditional hobby. You do not need to be musical or particularly strong and if you can get to the Ringing Chamber you can learn. Once you have learnt to physically handle the bell, which takes from a few weeks to a few months, you will become a valuable member of the band. Ringing is a skill where you can never say that you know it all, there is always another challenge to try but only if you want to! If you would like to have a go come along to one of our practices or contact one of the members below. As part of phase three of the Church restoration we are hoping to add two extra bells to complete the octave and give St. Michael’s a really fine peal. This will not only require two new bells but probably a new frame as well. We need lots of help to make this a reality and there are many ways you could get involved. Perhaps you could sponsor one of the new bells or its fittings and have your name inscribed alongside Patrick Brontë, or possibly provide some volunteer labour during the new works and of course we will need extra ringers! Further details will follow shortly.